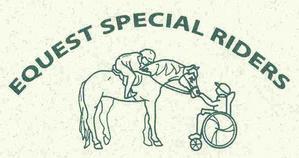 Equest Special Riders Inc. is a non-profit organization of trained volunteers who provide therapeutic-recreational horseback riding and instruction for persons left physically or mentally dysfunctional through irregularites of birth, high fevers, disease or trauma from an accident. A few students are adults; the greatest majority of the Special Riders are children. Children, who might never have walked, enjoy a chance to experience the exhilaration of moving freely, mounted atop a horse. While riders are involved in specialized games designed to improve coordination, the horse's gait massages their leg muscles. You need only watch one session to realize how much riding impacts the self-confidence and well being of the students. Thank You to everyone who had a part in making our annual auction a great Success. We Appreciate your support.